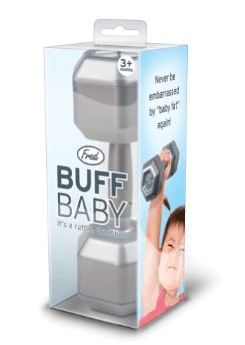 Buff Baby Rattle: It's a rattle, you dumbbell. Buff Baby turns Junior into a bench-pressin' body-builder! Your little one's curiosity will be piqued by the gentle rattle sound and natural hand-grips, while your sense of irony will be satisfied by watching Junior do 3 sets of 10. So work it, baby!